New kitchen caddies are being distributed to 95,000 homes across the borough by Ealing Council to make recycling food waste even easier. The caddies, which are smaller than the current food waste bins, can be kept on a kitchen worktop to save residents from having to keep going outside with scraps. Once full the caddy is emptied into the main food waste bin, which should be left out for collection every week. All houses and house conversions will receive a kitchen caddie by Friday, 23 July and residents can start using their caddies as soon as they arrive. The caddies are being provided to encourage more residents to recycle food waste. The council estimates up to 25% of all rubbish sent to landfill is food waste – including both cooked and raw food scraps. By using the food waste recycling scheme it will be sent to an anaerobic digestion plant where it is turned into liquid fertiliser and electricity. 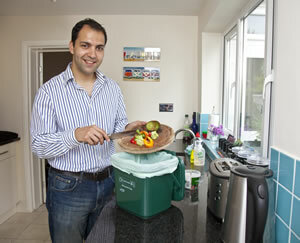 Cabinet member for Transport and Environment, Councillor Bassam Mahfouz, said: “Whether it's peelings or leftover food on the plate, too many people still throw it straight into the bin. Not many know that this food could actually be converted into energy and natural fertiliser. Black sacks are often torn open by foxes, birds and vermin looking for food, so using the pest-proof food waste bins is also a great way of helping keep our streets clean. The caddies do not have to be lined, but this helps to keep them clean and makes them easier to empty. Residents will receive one free roll of biodegradable liners to get them started. Additional liners can be purchased at a number of local suppliers in the borough, including major supermarkets. Liners need to display the suitable to compost logo. Alternatively, people can wrap their scraps in newspaper ‘fish and chip’ style. Plastic bags should not be used to line a caddy because they do not break down in the food waste recycling process. Food waste will continue to be collected from the large food waste bins on the same day as part of the normal refuse and recycling collection schedule. The kitchen caddies should be kept inside and not left out for collection. Any residents who do not already have the large food waste bin can order one via the council’s website at www.ealing.gov.uk/recycling or by calling customer services on 020 8825 6000.